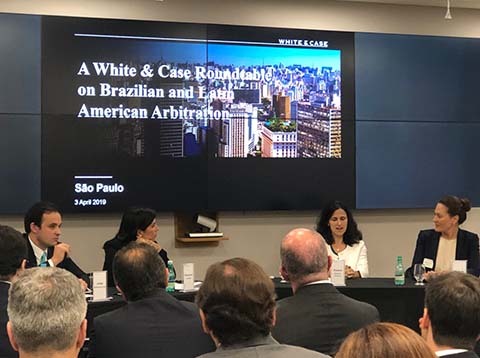 White & Case hosted a roundtable on Brazilian and Latin American Arbitration on April 3, 2019, in the São Paulo office. The panel included Clare Connellan (Partner based in London ), Jorge Mattamouros (Partner, based in Houston), Michelle Grando (Associate, based in Washington, D.C.), and special guest speakers, Eleonora Coelho (Secretary General of CAM-CCBC) and Susana Amaral Silveira (Associate General Counsel, Mover Participações). The discussion focused on the results of the QMUL-White & Case International Arbitration 2018 Survey and arbitration in Brazil and Latin America. White & Case is a longstanding leader in Latin American Arbitration.